Fleet operators in the United States are bound by the regulations of the Federal Motor Carrier Safety Administration (FMCSA) which is currently working to release a new set of Hours of Service (HOS) rules and regulations that carriers in the United States must follow. The regulations will see a shift from the old style of paper logs to dictating that all carriers must record and provide hours of service automatically and electronically. The new regulation means that it’s a great time to jump aboard the GPS fleet tracking movement, as Geotab offers tools that make compliant HOS tracking easy, in addition to all the other business benefits of GPS fleet tracking. Launched in 2014, Geotab Drive turns your driver’s smartphone or tablet into an hours of service reporting terminal. The Drive app links seamlessly with your Geotab device and integrates with the Geotab software platform. It is available for both Apple (iOS) and Android platforms. It can also be found on Geotab’s app marketplace – be sure to check that link out and take a look at all the amazing add-ons and apps available for your Geotab system! 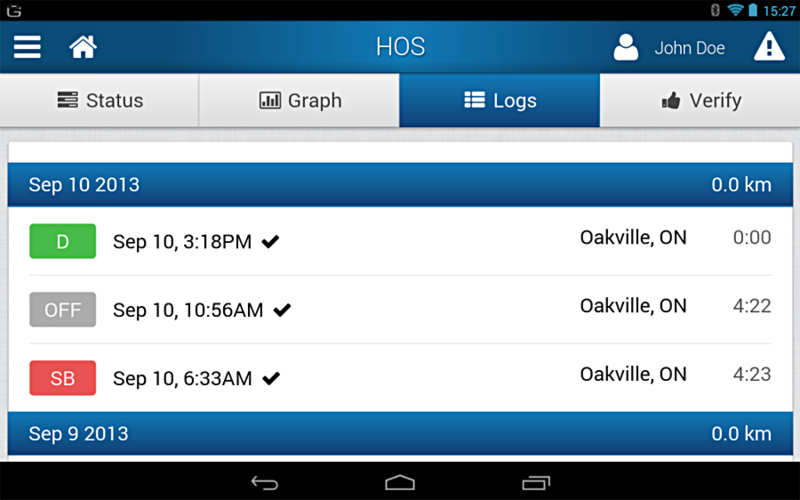 Why Use Geotab and the Geotab Drive app for HOS? Reporting on Hours of Service can be a burdensome task for your drivers, which can have a negative impact on productivity. Why have your team manually filing reports with pen and paper, when you can have it done automatically for them with Geotab? Improve employee moral, and make your business more effective with Geotab Drive. Geotab is the easiest product to install on the market and get rolling into your fleet. Geotab installs in seconds! Geotab is also compatible with your existing Apple iOS iPhones, and Android smartphones. All of this and more, all for a much lower cost than the competition! Because of the app’s integration with the Geotab device, it has the ability to automatically log when vehicles are moving. This means that while drivers can manually set their status (which they must do when they switch to sleeper berth or off duty), the app will automatically switch status from On Duty to Driving and vice versa. The driver is also able to apply exemptions such as Adverse Weather or their 16-hour Exemption with the push of a button. At the end of the day, the driver can verify their logs from an easy, convenient menu. The fleet manager or supervisor can then sign off on those logs within a 14-day period. In addition to Hours of Service tracking, the Drive app also offers support for Daily Vehicle Inspection Reports (DVIR). The app alerts the driver every half-an-hour, starting when they have 2 hours remaining, of when they’re coming up to a mandatory rest period. By regulation, the app switches the phone/tablet to Lock Screen when it is in drive mode, ensuring the driver stays undistracted, and remains aware of the road resulting in safer driving. Check out this video below that shows how easy it is for your drivers to get started using the Geotab Drive app. If you’re interested in an HOS reporting solution, it’s a must-watch! If you have any questions about the Geotab Drive app, feel free to contact us today. Get your fleet compliant with the new HOS regulations in the easiest way possible. In addition to seamless, easy Hours of Service reporting, the Geotab GPS Fleet Tracking system can lower fleet costs, save money, and improve on your bottom line! We send you the devices to try on your fleet. You try them out (plug and play, installs in seconds). 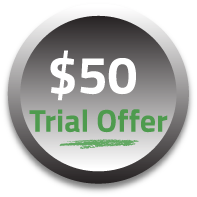 When you’re ready to purchase, we credit your account for $50 per trial device. It’s that simple to take your business to the next level. Read more about the business benefits of GPS fleet tracking, or get rolling with our $50 trial offer today!